Anthropomorphic form is human form of an object. The colloquial use of the word "form" emphasizes the physical shape of an object but designers view form as the total expression of an object. When the object is a product, form refers not to how something appears, but to the whole experience of interacting with the product--with its physical shape, materials, and behavioral qualities. Why do designers mimic human form in the products they create? Our research on anthropomorphic form will inform design research and design practice. Designers have a long history of imitating the human form. Contemporary anthropomorphic forms continue a long and rich history of the use of human shape for both functional and cultural purposes. This history traces back thousands of years to ritual vessels and connects to contemporary design in domains as diverse as vehicles, household products, and humanoid robots. What are the kinds of anthropomorphic forms? How is anthropomorphic form created? How is anthropomorphic form used? To begin answering these questions, we have surveyed numerous examples and explored anthropomorphic form through our own design exercises. In From Seduction to Fulfillment [PDF 668K], the authors identify four uses of anthropomorphic form in designed form: making things familiar, keeping things the same, reflecting product attributes, and projecting human values. Some examples of anthropomorphic form. From left, The koziol pot scrubber, two vehicle front end "faces," the Honda Asimo robot, and the Mac startup icon. In Imitating the Human Form [PDF 612K], the authors ask, "What aspect of human form is being imitated?" Four kinds of anthropomorphic form are identified: structural, gestural, aspects of character, and awareness. Examples of the four kinds of anthropomorphic form. From left, a structural artists model, and gestural Macintosh login screen, a gaultier perfume bottle that exhibits aspects of character, and the Pearl robot that exhibits some aspects of awareness. We have collected examples of the intentional use of anthropomorphic form by designers. These examples include work from product, graphic, and advertising design, architecture and art, and engineering and robotics. For each example, we describe how the designer has used anthropomorphic form. The entries have been grouped thematically. For example, the use of plants, vegetables and fruit in conjunction with human characteristics is a common theme, often found in products for the kitchen. These kitchen napkins are embroidered with images of vegetables with faces, arms, legs, and clothing. In addition to the structural elements, the images depict gestures, and show aspects of character. 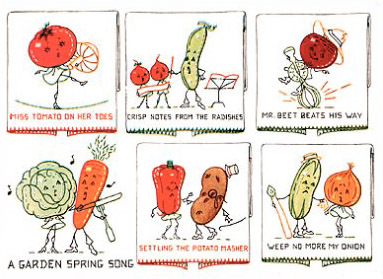 The vegetables perform, behave socially as they fight and teach, and even seem to express emotion. The napkins were found on an Ebay auction, where many mid 20th century examples of anthropomorphic product forms can be found for sale. Bush, D. (1990). Body icons and product semantics. In D. Vihma (Ed. ), Semantic Visions in Design pp. c1 - c14). Helsinki, Finland: University of Art and Design Helsinki Press. Caporael, L.R., Heyes, C.M., (1997). Why anthropomorphize? Folk psychology and other stories. In Mitchell, R.W, Thompson, N.S, Miles, H.L (Eds. ), Anthropomorphism, Anecdotes, and Animals (pp. 59 - 73). State University of New York Press, Albany, New York. Guthrie, S.E., (1997). Anthropomorphism: A definition and a theory. In Mitchell, R.W, Thompson, N.S, Miles, H.L (Eds. ), Anthropomorphism, Anecdotes, and Animals (pp. 50 - 58). State University of New York Press, Albany, New York.